Don’t Pay for Your Builder’s Mistakes: The Importance of A Builder’s Warranty Home Inspection! FACT! Your Builder’s Warranty On Your New Home Is About To Expire And You Need An Independent Evaluation Of Your Property By A Professional Tampa Home Inspector! SEC Inspection. Home Investment Protection, That’s What We’ll Do For You! Give SEC Inspection a call today! 727-786-0460 | We will evaluate your home from the foundation to the roof and all areas in between. We’ll then produce a report with a list of issues that you can give to your Builder so that he can pay for his own mistakes and you won’t get stuck holding the bag for future repairs. Don’t Let Time Run Out On YOU! Your Builder Provided a 1-Year Builder’s Warranty Which Covers Defects In Workmanship Or Materials. Call Us Today 727-786-0460 or Schedule Now! PS: Be Sure You Mention You Received A Card From Us When You Schedule Your Builder’s Warranty Inspection So That You Can Receive A $29.00 Discount. PSS: Call Us Right Away As The $29.00 Discount Expires Soon! 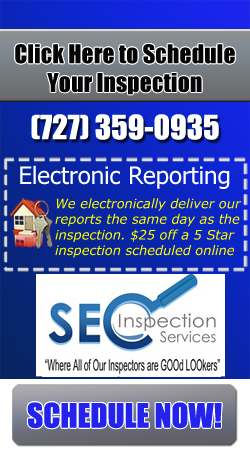 Call SEC Inspection Services Today 727-786-0460 or Click To Schedule Online 24/7 Right From Our Website.